Earn $8.49 in Rewards credit (849 points) What's This? 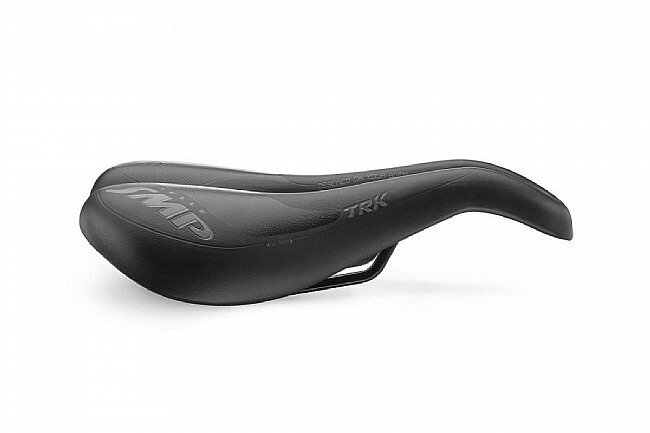 The TRK Saddle brings Selle SMP's unique ergonomic design to a more affordable price. The emphasis here is on comfort above all else. The TRK is perfect for recreational riders and commuters, featuring the same revolutionary dropped nose and large central cutout of the SMP road racing saddles with the addition of heavily cushioned padding and a wider shape for additional comfort and support. This Gel version includes a self-modelling GEL insert that conforms perfectly to the rider to reduce pressure by 30%. 280mm Long x 160mm Wide. 485 grams. Steel rails. Made in Italy. After a 15 yr hiatus from peddling I finally got a Ebike and find myself doing the same rides I did as a 25 yr old but my 64 yr old assprostrate needed a better saddle this is it - awesome comfort and support where needed - buy it you wont be the least disappointed. I really like Selle SMP saddles. I use the pro on my road bike but wanted a bit more padding for gravel. The reason this is 4 stars is that it has just a bit too much padding and the cover doesn't seem very durable. Bought this for my new trek and I've put about 140 miles a week on it for the last 3 months. It's very comfortable and makes a world of difference on long rides. Glad I finally tried it! I ride approx. 50-miles a week, and usually my rump is hurting within the first few miles. After just a couple of rides with this Selle SMP TRK Gel, I found that this seat is the best I have ever had. And it seems to get better with each ride! I'm going to have a really hard time riding any other saddle after spending some quality time with this one. This is the saddle to have when the trail has a tantrum and starts throwing punches. Long distance comfort and low profile. It is comfortable, I can ride in the drops again without numbness. Worth the small amount of extra weight. I was able to dial in the saddles position during one ride. The dropped nose is great for alternating standing and sitting, the saddle has a sweet spot that is comfortable. Installed on my touring bike, and promptly headed out on a 3 day ride with no prior aclimation to this new saddle. Some soreness, .....and promptly went back to my Brooks imperial. Not the SMP's fault. Will give it a go on another bike...I'm sure it will be fine.. I dont need bike paints with this seat. Firm and soft at the same time. I get no vibration up into the seat. After trying several saddles for proper fit I finally found one that's perfect for me. I ride long rides and the width is perfect for me and its very comfortable for real long rides. Still fairly lightweight too. This is the best saddle for my style of riding. This saddle is the greatest! I have tried at least 5 others but have finally found the one. Buy it! Love it! Ride on! I ride a Trek TTX for triathlon. I use this saddle for training now. The gel model is a bit heavy so might get the race seat for events. This allows me to train hard for extended hours without undue pain. Cant say enough good things about it. This is a great seat for me. I needed a more comfortable seat where comfort is more important than weight. I am using this saddle on my trainer and noticed the difference right off. Very comfortable, with padding in all the right spots. Am able to ride longer and easier. Great saddle. Update on the saddle that I bought from bikes direct in May for my 5 ft 11 inches, 170 lbs frame and sit bone width of about 130 mm. I ride a gravel bike in a more moderate sitting position so not completely upright and not stretched out either. The saddle was delivered in perfect condition. I now have about 1300 miles on the saddle and it is showing some signs of wear on the surface. . The saddle is a bit wide and the edges in the front are sharp. It is comfortable for 2-3 hour rides but at the end of the ride, my sit bones start getting achy. The large cut out and saddle design (drop away nose) makes it very comfortable in the groin area. Not perfect but good value for the money. I just ordered the Selle Italia man flow gel saddle from bikes direct to see how it compares. Excellent seat, I replaced my stock saddle on my Trek for this. I'm a rather big guy (6'3, 200 lbs) and find this really comfortable. i tried other, more expensive saddles, but this works the best. I can ride a century with no problems. After 2 other seats, this is the first seat that prevented saddle sores during a 6 day tour. I installed the seat myself on my Trek Silque road bike. I ride in the Appalachian Mountains moving fore and aft on the saddle. It is easy to know when I am in the sweet spot for climbing. For the anatomy, it seems to be a good fit for reducing any pressure on sensitive female anatomy. As a 52 yr old, it is all about comfort. This saddle work well! Very comfortable on the longer rides. I like to go out on longer rides and on a regular saddle will have some numbness towards the end of my ride. This saddle is more comfortable and I don't have that uncomfortable feeling at the end of my ride. I know this is not ideal but I had to bolt this seat on prior to a century and had the most comfortable ride I have ever had. I had always suffered from pain, numbness and unpleasant after effects with other seats, with this one everything was pain free and functional during and after the ride. Well worth money. A great saddle, so good I bought a second one. I like hard, hilly, long-distance riding about 4000 miles per year. Other saddles I've used have been OK, but I decided to try Selle SMP to avoid potential prostate and urinary duct problems. I liked the comfort of the SMP after one ride and loved it so much after 100 miles that I bought a second one. A touch pricy and a touch heavy, but definitely worth it. I recently bought a Specialized Diverge Expert and was looking for a comfortable saddle. Most of my riding is on road, paved and some rough unpaved with an average of 25-30 miles. Tried the specialized saddles (avatar & phenom), the fabric scoop radius (143 mm) and fabric cell (155 mm) and finally this saddle. This proved to the most comfortable for me. No achy sit bones. I am 5 feet 11 inches and weigh 170 lbs with a sit bone width of 130-135 mm. The only negative to the SMP is the weight at a hefty 485 g. Otherwise a very comfortable saddle with no aches anywhere. Highly recommended for folks with no natural cushioning and who like riding more upright. Also, a very good price from bikes direct and the saddle was delivered in perfect condition.